On my first visit to Piran—eight years before, on a day trip from Trieste just 23 miles to the north—I ended up spending most of my time in the woodsy little Okrepčevalnica Cantina, tucked into the corner of a square buried in the backstreets (Trg 1 Maja 10, Piran; tel. +386-(0)5-673-3275). Tartinijev trg 2, tel. +386-(0)5-673-4440, www.portoroz.siI'd stopped in for just one drink, but when I went to pay for my glass of Teran I asked the kindly older proprietor about tap behind the counter labeled refošk. She smiled and poured me a glass of this light red on the house. Then I asked what the plastic jug of what looked like cloudy grapefruit juice by the register was. "Mošt," she said. "New wine," and, waving away my wallet, poured me a tall glass of that. Then she asked if I wanted to try the Malvasija. It went on like that for an hour. This time I was determined not to let Istrian hospitality get in the way of seeing the sights, so I bypassed the cantina and started exploring. 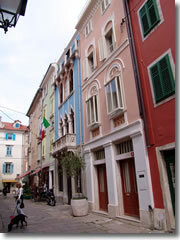 The back alleys of PiranPiran follows the general model of most coastal Istrian towns: a jumble of Venetian Gothic buildings terraced along a narrow thumb of land jutting into the Adriatic. Since my last visit the parking lot had been evicted from the center of town, by the tiny harbor inlet bobbing with fishing boats, and replaced by a pedestrian square paved in marble slabs called Tartinijev trg. Kids kicked soccer balls around the modern sculptures populating this new Cartesian expanse. Young couples in sunglasses chatted and compulsively checked their cellphones at outdoor café tables along one side of the square; on the other, old men gathered around chess boards on the stone benches shaded by the Neoclassical Loža. I stopped into the tiny Neoclassical church of St. Peter on Tartinijev trg to marvel at the Crucifix of Piran that looks almost modernist but was carved in the 1300s, and chatted with a photographer who had a show hanging in the quiet 14th-century cloisters of the Friary of St. Francis. Singing from the tiny medieval church of St. Stefano echoed through the back alleys as I climbed toward the church of St. George, lording over the topmost point in town. An old woman, swaddled in black, had just finished washing the church steps and bent double to weed the seam where the wall met the cobblestoned street. The interior was a decorous baroque abundance of art and gilded frippery, the titular St. George slaying his dragon in both sculptural and ceiling fresco form. 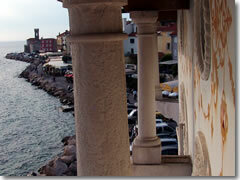 The view from my room at the Hotel Piran.I clambered back down through the backstreets of town, past outdoor market selling baskets of nectarines and cherries and piles of purple artichokes and local tart kiwis, to my hotel, the waterfront Hotel Piran (Stjenkova 1, Piran; tel. 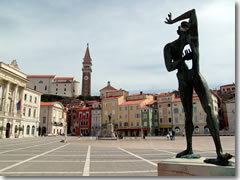 +386-(0)5-676-2100; www.hoteli-piran.si, double rooms from €60 online). I had checked in earlier and—much to the surprise of the bloke at the reception—asked if I could downgrade from the room I had been assigned—in the more amenity-laden, pricier, and blander rooms in the two modern wing—in favor of a cheaper, cozy mansard twin with sea views in the original Art Nouveau structure, shaped a bit like the prow of a boat jutting toward the breakers across the street and the sea just beyond. Pršut and other yummy appetizers at Piran's Restaurant Pavel.Joining the gelato-licking Italian families strolling the waterfront promenade by my hotel, I ended up at Restaurant Pavel (Prešernovo nab; tel. +386-(0)5-674-7101). The sound of waves slapping and sucking at the jumbled limestone breakers was louder than the clink of cutlery, and my waiter gently guided my choices to the grilled sole, medley of grilled vegetables, and palačinke s čokolado (crepes smothered in chocolate sauce). 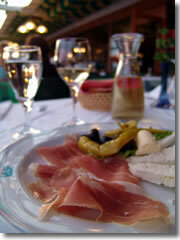 He also recommended I sprinkle olive oil and cracked pepper on the tart goat cheese that came with my appetizer platter of salami, pickled veggies, and pršut (Istria's rustic cousin to prosciutto, or air-dried ham, heavy on the "dried"—come to think of it, it falls somewhere between prosciutto and jerky; toothpicks are essential). After dinner, I wandered the moonlit alleys of Piran and was drawn, inexorably, to a theatrical little square buried in the backstreets and the wooden tables of the Okrepčevalnica Cantina. 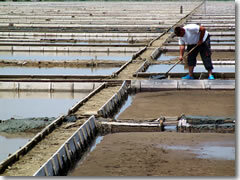 Working the soline salt pans.Slovenia's main coastal town is called Portorož, an awful strip of cement-block hotels marching right up to the entrance to the far more charming Piran. At a bend in the main road leading south out of Portorož, a steep cobblestoned lane dives down to the right and ends at the Krajinski park Sečoveljske soline, a vast plain divided into grids for the evaporation and production of sea salt. In continuous use for at least 700 years, these historic saltpans are operated today as a national park and living museum, its 650 acres still worked by hand using simple tools (tel. +386-(0)5-672-1330, www.soline.si or www.kpss.si). There's a museum with interactive displays on the surprisingly fascinating history of salt and the craft of making it, and an on-site shop hawking, naturally, salt—in more varieties than I ever realized existed—plus salt soap, salt mud (for beauty treatments), salt olive oil, and even salt water (honest; it costs €12.28 a bottle). Munching on some salt chocolate (better than it sounds, like a chocolate-covered pretzel without the pretzel), I walked back to my car along the high dirt bank between endless salt pans where barefoot men worked their beds with long poles, sparrows hawked for insects, tiny brine shrimp scuttled through the ponds, and white egrets stalked the waters on black chopstick legs. 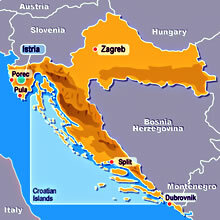 My stay in the Istrian sliver of Slovenia was over. It was time to continue across the border and explore the Croatian coast.